Meditation is more important than just sitting in a quiet place and being still. It’s about connecting and being in the moment, right here on planet Earth. Many people resist meditation because they think it’s boring and a waste of time, and that working and going out and partying are more important! Meditation is more important than just sitting in a quiet place and being still. It’s about connecting and being in the moment, right here on planet Earth. Many people resist meditation because they think it’s boring and a waste of time, and that working and going out and partying are more important! They justify that choice because they believe those activities result in what they think they should have—money or relationships with others. The benefits of meditation are so multifaceted—it can change your life in many ways. Regular practice makes you more peaceful and relaxed, improves your intuitive skills, increases blood flow and alleviates stress, for starters. It’s funny that some don’t realize its importance and instead focus on whatever provides instant gratification. It’s almost as if we only value activities that offer benefits that we can physically, mentally or emotionally perceive. There’s a reason so many cultures believe in meditation as a means to live life in harmony and balance with all of nature. Many religions outside of Western belief start their day with meditation as part of their daily ritual. They view meditation and connection to Source the same way we look at getting up, going to work or having a relationship. Eastern beliefs are focused on the idea that the more relaxed and calm we are in our lives, the easier it is to flow with information and problem-solve situations as they come up. Meditation enables us to be more grounded and focused on our life’s purpose. It helps us to take notice of the environments we are part of and act as an awakened being, aware of its surroundings. If you think you don’t have time to meditate, let’s be real. We’ve all got time to get up in the morning, brush our teeth, wash our face, get dressed and even hit up Starbucks. We make time to talk with friends, work out and do whatever it is we really want to do. If you say you don’t have time to meditate, you’re just making excuses—the truth of the matter is that your excuse is not real; it’s just your way of avoiding something that can truly change your life for the better. The most difficult obstacle blocking people from achieving their goals is the fact that they don’t know themselves as well as they think they do. The ego wants you to subscribe to what you already believe so you don’t go inside and start asking questions. This is why meditation is so important—it’s about being present in the moment and helps you to get in touch with yourself, learn about yourself and love yourself. The more knowledge you have about yourself and the better you understand, the easier it will be to determine why you are here and what your true purpose is. You are a dynamic, amazing and powerful being, but you don’t need to hear that from me. You have to hear that from yourself. There are many different types of meditations. Forget what works best for others—you only have to find one that works for you. I enjoy guided meditations, silent meditations, breathing meditations and Zen walking. One of my old teachers told me the best way to meditate is to go somewhere that is very noisy because if you can meditate in a surrounding like that, you will be able to meditate anywhere and everywhere. Here are some tips to get you started—take five minutes out of your day to just sit and focus on your breath. A good thing to do is imagine yourself going down an endless tunnel. Notice how you feel and what thoughts come to mind. As your practice continues, gently increase your time. Work towards 10 minutes, then 15, 20 and so on. 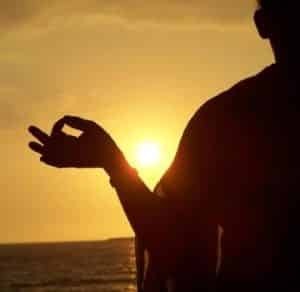 This should get you moving in the right direction towards finding inner peace and enjoying the plethora of benefits that meditation provides. You can also check out the store at ShamanDurek.com for meditation downloads I created to assist you on this awakening. Learn, love and inspire greatness. Follow me on Twitter @shamandurek or watch my videos on YouTube for inspiring messages.